Initially slow to take up the idea when it came to QR codes, the fashion industry has now taken to these codes like a duck to water. However now that the idea has taken off, the fashion industry can’t get enough of this brilliant digital marketing. For those who are not in the know (as I was until recently) Quick Response or QR codes are those square futuristic-looking matrixes which have been appearing newspapers, magazine ads, department stores, product displays and, in giant size versions on billboards. Originating in Japan in the 90’s QR codes are applauded by ad men working in a variety of industries around the world. They are cheap, easy to manage and you can put them anywhere from labels to print adverts to the back of stadium seats. As for the fashion industry, the codes themselves have become something of a fashion statement. Just weeks before QR codes where embraced with a vengeance at New York fashion week, a model trotted down the runway at a Barcelona fashion show with a large QR code incorporated into the bodice of her silver and black Frans Baviera gown. 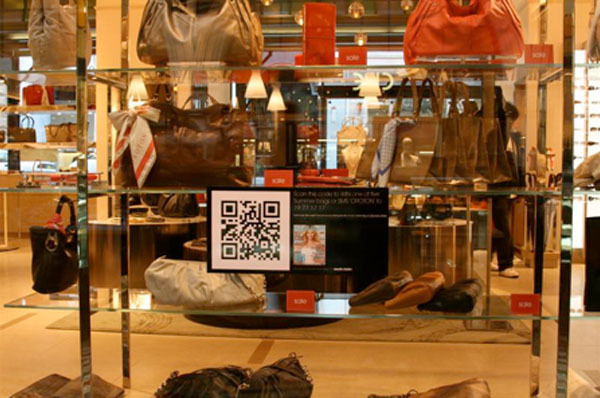 Attendees at New York fashion week this year report that QR codes were the hottest trend around . According to insiders, QR codes were everywhere with all of the big labels featuring them. A Barbie themed bus came equipped with QR code signage. High-end jeweller, Tiffany, had frosted QR codes appearing on Cookies which were handed out to guests at the show. By clicking on the QR code the guest was linked to a promotional event. How do they work? Point an iphone (with the appropriate QR scanning application loaded) at the code and you have instant access to information, guides, videos and other information about the product. According to marketing group Mnet, working for fashion house Oroton, a marketing plan this year using QR code yielded a response rate up to eight times the industry standard. Watch this space. QR codes are taking over the world!